It’s not often you get to paddle under a UNESCO World Heritage Site, a Category A listed structure and the biggest infrastructure project in Scotland. That’s what happened when three friends and I paddled under the Forth Bridge, the Forth Road Bridge and The Queensferry Crossing. We made the most of the tide, which carried us from our launch site west past Inchcolm island and onto the delightful village of North Queensferry. As the tide slackened and began to ebb, we treated ourselves to fresh coffee from the little local cafe. It looked like a fine place for a more substantial lunch stop next time. Even on a grey winter’s day it’s worth exploring the nooks and crannies of the little harbour. The North Queensferry Harbour Light Tower was built in 1817 by the famous Scottish engineer Robert Stevenson, which apparently you can visit. Coffee stop and comfort breaks done we headed west under the new Queensferry Crossing. We got a seagull’s view of the magnificent concrete towers, amazingly the traffic noise is minimal compared to the old road bridge. 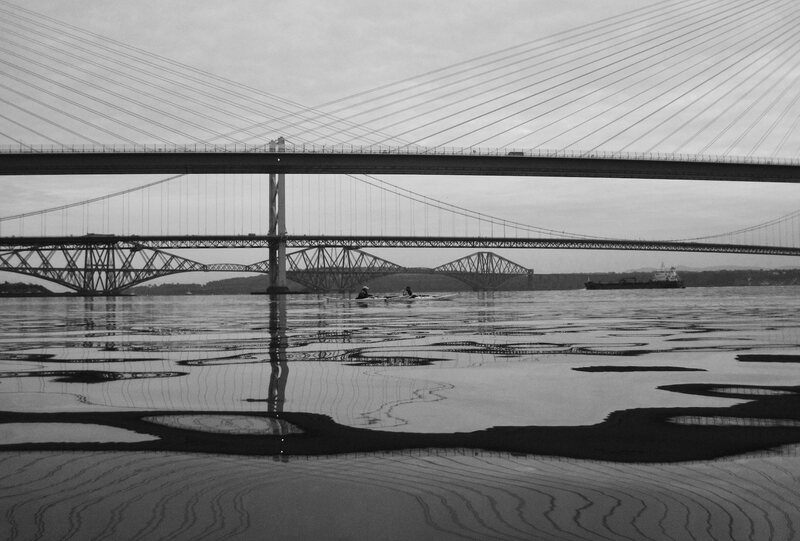 By now the tide had turned so we paddled right out into the middle of the Forth and rode it back under the original Forth Road Bridge and the original Forth Bridge. The tide can be a little faster under the big red girders of the rail bridge and we played in the flowing waters for a while. We were having fun but it was late November, and it gets dark about 4pm and we still had about 12km to go!! A quick shortcut, helped by the tide and we were soon back at our starting point. A quality day on the water and I’m very fortunate to have a world-class paddle on my doorstep. Are you interested in doing this trip? If so I’d love to hear from you. Suitable if you have already done a few days kayaking. Please get in touch or call 07760 887 034.